The Organizer recounts how ACORN became one of the largest community-based organizing groups in U.S. history. At a time when many social justice advocates claim that digital tools and foundation-funded social policy can replace actual organizing of those squeezed in the cruel vise of inequality, a reality refresher is helpful. One is coming to Oakland's New Parkway Theater on May 25 — The Organizer, the story of ACORN and its founder, Wade Rathke. ACORN's story is fascinating. Founded in 1970 in Little Rock, Arkansas, by idealistic whirlwind Rathke, the organization became one of the largest community-based organizing groups in U.S. history. (Full disclosure: Being from Little Rock, I knew Rathke and many early ACORN leaders and staff in the '80s and '90s. At that time, I occasionally represented ACORN in legal actions.) The organization grew to include roughly 500,000 members in 1,200 chapters in the U.S. But along the way it suffered relentless attacks from the Right and endured internal problems reminiscent of a Greek tragedy, which eventually destroyed its national presence in 2010. "The goal of ACORN is to win power for low- and moderate-income people to have more control over what happens in their neighborhoods," a local organizer told the Express in 2007. Our writer wrote, "They aren't subtle, but they get attention." The early version of ACORN helped people obtain clothing and furniture, campaigned for schools to provide healthy, affordable lunches, and supported Vietnam veterans. It assisted hundreds of thousands of working-class and poor citizens obtain home loans, register to vote, and fight for better wages. It nurtured leaders who became advocates for the poor in local politics, pioneered a successful model of community-based unionism, and engaged in organizing that helped elect Barack Obama. Predating the Occupy movement, in June 1982, ACORN sponsored "Reagan ranches" in Washington, D.C., and other cities, protesting Reagan's military buildup, which starved social spending. In defiance of the National Park Service, tent cities were erected for two days on national park grounds. Members marched on the White House and testified before Congress about America's housing crisis. The history of resistance to the power of the elites moves in a dialectic between outstanding individuals and mass movements. Often it takes inspirational leaders such as Rathke to unleash nascent power. Growing up in New Orleans in the 1960s, Rathke attended Williams College and sampled what the New Left had to offer. Turned off by the sectarianism and in-fighting among groups like Students for a Democratic Society — much of which we now know came from active FBI infiltration — Rathke moved in a different direction. His organizing strategy came from Saul Alinsky, whose Rules for Radicals motivated many organizers. Few were as successful as Rathke. The Express covered ACORN's local organizing over the years. In the late 1990s, poor Oakland neighborhoods were particularly attractive to predatory lending because residents, often older people of color, were "house-rich and cash-poor." "Predatory lending is about the global finance system ripping off your grandmother in East Oakland; it's a wealth transfer of equity from low-income and working-class homeowners to large predatory lenders," an ACORN leader told the Express. In conjunction with several unions, faith-based groups, and others, ACORN noisily pushed for governmental reform to protect consumers from predatory lenders. In 2001, due to these efforts, Oakland and the state led the nation in passing anti-predatory lending bills. In 2007, ACORN formed Tenants United. The organization, according to a local leader, functioned like a union, surveying members' needs and wants and designing organizing strategies in response. "We do a lot of door knocking to see what issues tenants are concerned about," he told the Express. "What we found was that tenants were very upset about landlords not maintaining property, letting security get lax, infestations, that sort of thing. And in most cases, we found that tenants were either unanswered in their requests for change or were afraid to confront their landlords for fear of retaliatory evictions — especially if they were undocumented." Released in 2017, The Organizer is a well-made movie containing inspirational footage of ACORN — and Rathke — in action. Watching ACORN members practice organizational democracy is refreshing. These scenes are in sharp contrast to today's digital organizing groups, which believe that all resistance can be monetized through social entrepreneurship. These days, many internet-based organizations count an email in a database as a member, but ACORN's members acted on the streets, not from behind a computer. The story of ACORN also shows the vulnerability and fluidity of worker- and community-based organizations. But the idea of ACORN is not dead. Many former local chapters exist doing good work. Rathke has retained leadership in ACORN International, which, according to him, has close to 50,000 members in India alone. There, members who work as street vendors, moto-rickshaw drivers, domestic workers, and waste pickers organize around important community issues. ACORN inspired those in poor communities to come together and learn to harness their power, acting locally in a DIY fashion. For those concerned about building worker and community power, The Organizer is worth a look. 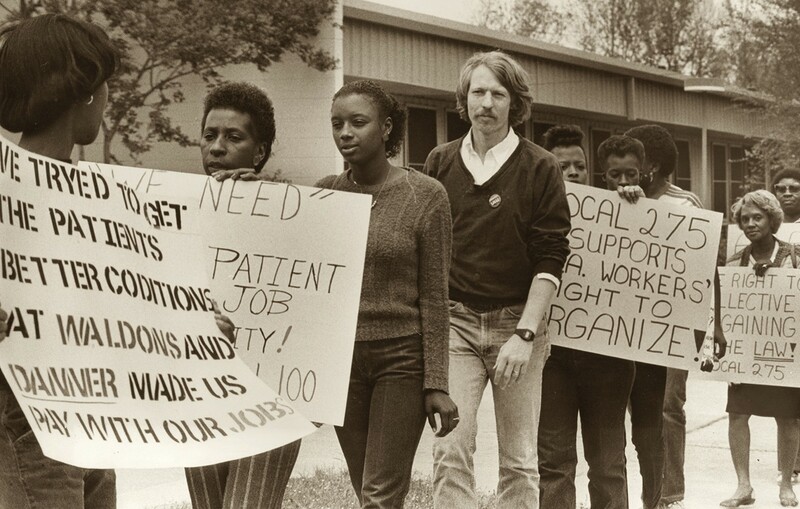 The Organizer will screen at The New Parkway Theater, 474 24th St., Oakland, on Friday, May 25, at 6 p.m., $15, $50 (includes signed copy of Wade Rathke's book, Nuts & Bolts: The ACORN Fundamentals of Organizing). Screening followed by discussion with Rathke.